Riverside’s Levi Godwin brings down Lehman Catholic’s Brendan O’Leary during a Northwest Central Conference game on Oct. 25, 2018 in Sidney. 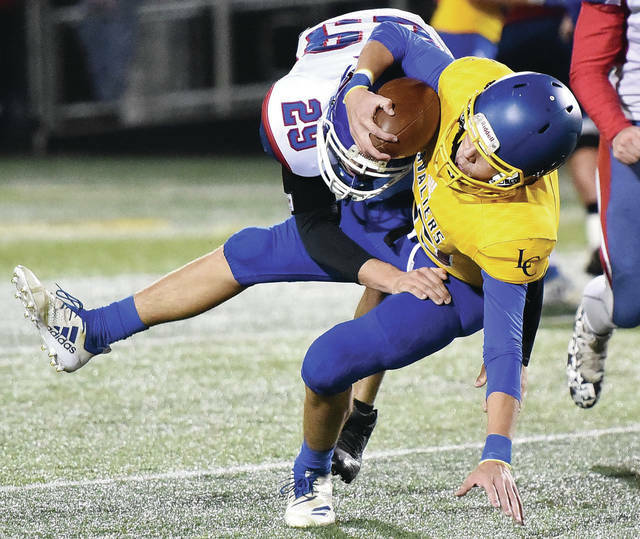 Both Riverside and Lehman are leaving the NWCC to join a new league in two years. Lehman Catholic and Riverside will leave the Northwest Central Conference and begin play with a new league starting in the 2021-22 school year. The schools are among eight that announced on Monday their intentions to form a new athletic conference. The other schools are Miami East, Troy Christian, Covington, Milton-Union, Bethel and Northridge. The eight schools currently are members of four different conferences and will remain in their respective conferences for the next two years. Miami East, Bethel and Covington are members of the Cross County Conference. Troy Christian is a member of the Metro Buckeye Conference — and has competed as an independent in football since 2013. Milton-Union and Northridge are members of the Southwestern Buckeye League. The seeds for the new conference were planted in February when 10 schools — Newton, Bradford, Arcanum, National Trail, Twin Valley South, Tri-County North, Tri-Village, Ansonia, Franklin Monroe, and Mississinawa Valley — submitted letters announcing their intentions to leave the Cross County Conference. Those 10 schools will begin play in a new, also unnamed, conference beginning in the fall of 2021. Fort Loramie is currently a CCC member for football and girls golf and is the only conference member that will not be involved in either new league. Decreased travel time will be benefit for both Lehman and Riverside. The NWCC includes schools in a vast area, from Lima to Marion. Lehman and Riverside are the league’s southernmost schools and the only two that compete in OHSAA Southwest district tournaments. Contact David Fong at dfong@aimmediamidwest.com or follow him on Twitter @thefong.